Den of Geek - Black Lightning wraps up its second season with a quiet family moment and an ominous warning of things to come. TV Line Finale Recap: Power Outage — Plus, Season 3 Foe Revealed! 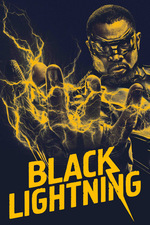 I'm still pondering how I feel about this season, but I think that's a good thing: Black Lightning is a lot more complicated and murky than the rest of the CW superhero content. AV Club - Freeland burns, but Black Lightning loses some of its fire: "This has been a curious season of Black Lightning. Whether it’s the extended episode order or simply a sophomore slump, the show often struggled to reach the heights of its first season, where solid character motivations and stories that deftly tackled social issues rounded out an otherwise familiar story of superhero origins. Instead, storylines were introduced with full force before petering out—don’t even get me started on Grace Choi and whatever the hell Black Lighnting was trying to do with that—stumbling towards lackluster conclusions." I gotta agree with the AV Club that some stuff (Lala, Grace Choi, the evil principal) was pretty weak/not baked all the way through/left by the wayside. On the other hand, I really liked Jennifer's journey (and poor Khalil) and thought that was well done. I am amused we have Black Lightning and now Lightning. Not that you could really call her anything else, but it's also ... yeah. But what would you go with, Orange Lightning? Yellow Lightning? The dinner table scene was very sweet until interrupted. Lala just makes me sad. Can we leave him dead already? I rolled my eyes at Tobias sulking about his riot not being so riot-y any more. I very much enjoyed this season but agree that several of the sub-stories were poorly thought out. Why bother with the Grace or principal stories if they just get forgotten? Was that Khalil in the tube at the end? I guess somehow I've missed the fact that Jeff needed to tap into the existing power grid. I knew he could do that and get a boost, but I thought he was a self-generating type of energy hero, closer to what Jen is. I think bringing back the preacher was a major cheat. I mean sure, they did it with Gambi, but we all knew he wasn't going anywhere. This, however felt too much like a plot device: they needed him to quell the riot with his love and resurrection speech. I appreciate that they're trying to set up longer-term story lines (i.e. Grace Choi) but I just wish they were better story lines (or at least less problematic ones from the character perspective). From a comic book perspective, Dr. Jace is in Markovia where she needs to be. I'm very unsure (to put it mildly) about a plot that involves tiny European(ish) Markovia attacking the U.S. on its home soil, metahuman army or not. I think that's really the wrong direction for this show to take. I like the focus on urban U.S. problems and people looking to tackle them who are part of the community. Schools, police, even religious organizations can be part of the problem and part of the solution to serious issues (including but not limited to drugs and lack of economic opportunity and gang warfare and racial discrimination) and while this is a superhero show with elevated stakes, these are all problems that are mirrored in the real world. I think that's what makes this show stand out from its DCCW counterparts. Suddenly throwing that aside to ramp up some international super-powered conflict feels like a potential misstep waiting to happen. Overall, I don't think this season was as strong as the first one, but we've seen that with these DCCW shows before. The question is whether it continues to fall down the rabbit hole of bad plots and misused characters or if it redeems itself and becomes something a little different and a little better than the typical superhero fare. Personally, I'm not willing to give odds one way or the other. The mysterious doctor was called "Lazarus Prime" by Tobias, and clearly Tobias knows he's the one that brought back Lala, but seemingly unaware that Lazarus also encouraged Lala to kill Tobias. Who knows what they'll do with him, but it's an odd insert into the season to not expound on. I'm ok with waiting until next season for more Grace and Principal Lowry, Grace is going to be a longer character arc for Anissa (who admittedly didn't have a whole lot of focus this season except for the Perdi/Sange episodes, and Grace stuff) so that'll be welcomed, and Lowry is a good social justice plot device that they can pull out whenever it's relevant. I'm hesitant though, like you all, about this global scale the show is going to. I understand wanting to fit Markovia in because of the comic roots, but I wish they didn't have to and pursued their own path.